So here we go, my first post EVER! This first post will be about this little café that I discovered last week. I was researching a place that serves GOOD coffee where I could go with my girl friends for breakfast after a long walk on the beach. We have been “unfaithful” to Baldwin Beach on the North Shore and just because we wanted a change we have been exploring the beaches on the Kihei side. (More posts on that another time) So I googled café Kihei and here pops Belle Surf Café, which serves crêpes. Being French that drew my attention. It sits at 1794 South Kihei Road and it was easy to find, across from the Kihei Theater. For the first time in my life I was served a coffee “just like I have seen on tv”, with the little design! How cool is that! So nice! But it wasn’t just pretty it was also the best coffee I have tasted on Maui. 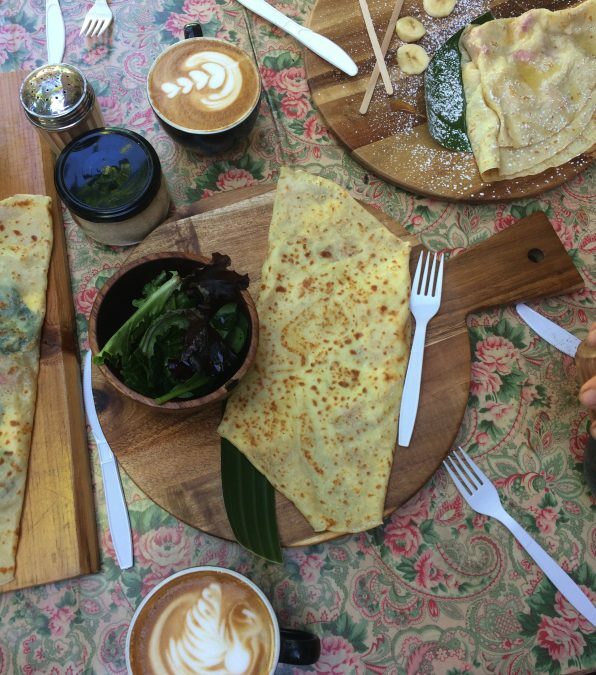 The crêpes were the real deal, the true crêpe française, the fillings are fresh and delicious. But that’s not all. When I asked the cashier “Who is French here?” She pointed at a young lady prepping food in the back and said “Marion is, she is the owner”. So we met, and we learned that we live just a few 100 yards from each others, and that she knows my son Marlon (everybody knows Marlon!!!). How fun is that!!! Small world… well… it is Maui!